Who are we? We (Drs. Paula Shrewsbury and Rebeccah Waterworth) are entomologists at the University of Maryland (UMD) who study pest insects in managed landscapes. We try to determine some basic biology of these pests if it is not already known. We also want to learn what parasitoids and predators might attack these insects and reduce pest numbers. This is a type of pest management known as biological control. Another focus of the research conducted in our lab is to try to conserve populations of good insects by providing them with the things that they need to survive and reproduce, such as places to hide, a better microclimate, and flowering plants if they need nectar and pollen in their diet. This is a strategy called conservation biological control. ​What is this project all about? What do we need? We want to identify the species of good insects, specifically the parasitoids, which attack the eggs of all stink bugs in Maryland. Most stink bugs are herbivores and some can be serious pests of crops, such as brown-marmorated stink bug (BMSB). One of the key natural enemies of all stink bugs are the parasitoid wasps that lay their own egg inside the egg of a stink bug. These parasitoids are very small and almost microscopic; they cannot sting people. If all goes well after parasitism takes place, a wasp emerges from a stinkbug egg and not a stink bug! This wasp will then look for more stink bug eggs to lay her own eggs. (See the video posted below about the parasitoid life cycle and behavior.) We would like volunteers to collect egg masses in their area and send them to us at UMD. Once the egg masses are on campus, we can identify the species of stink bug that laid the eggs and let any and all parasitoids emerge and identify them. 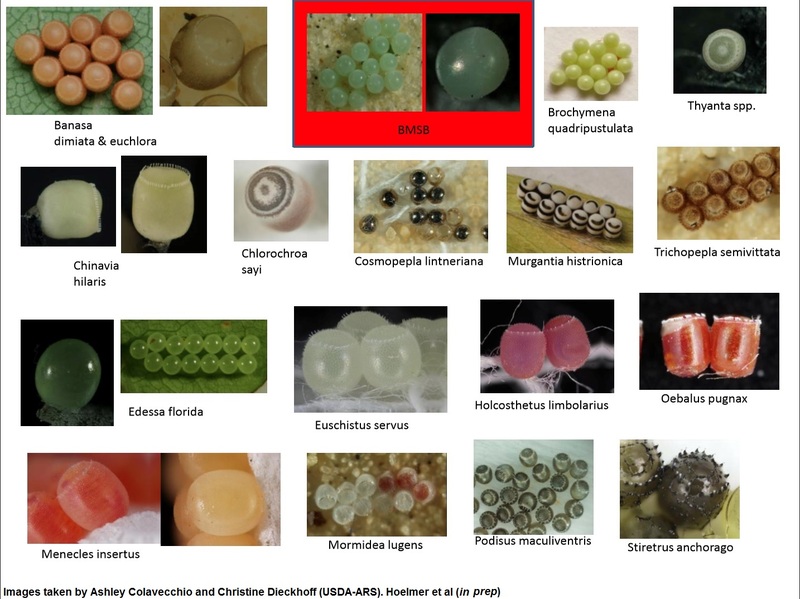 Why collect egg masses? We need to know more about the parasitoids and if they help control some species of stink bugs, such as brown marmorated stink bug. We have a relatively small sample of egg masses from which we have identified parasitoids, only looked for egg masses in a handful of places, and been able to collect egg masses of only a few species of stink bugs. This past sampling effort probably does not give an accurate picture of what the parasitoids are in Maryland and the species of bugs that they parasitize. It would be great to have the help of participants searching for egg masses from many places so that we can make conclusions about bugs and their natural enemies. Once we know about the parasitoids, it will be possible to consider options for better managing bugs, such as conservation biological control. ANNOUNCEMENT: Project Stink-be-Gone has wound down for the summer! Please send your data sheets and supplies to University of Maryland by Sept. 1 2018. (You may keep the spiral bound field guide!) Thank you all for your interest in the project and helping us search for stink bug egg masses. Please don't hesitate to write (rwater@umd.edu) if you have questions.